Even if you’re the prince or princess of prezzies, and socks are the last thing you’d ever give, no gift lasts as long as the memories made by being there in person. With our nationwide services connecting people right through the festive period - including Christmas Day and New Year’s Day - you can get closer to those far away for less. And the seasonal cheer doesn’t end there. Book your journey on our website by 23 December for travel by 31 December, and get a discount code for 50% off another journey between 7 January and 15 February*. Details on how to get your code will appear on the booking confirmation page. 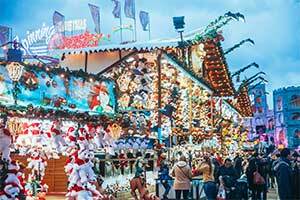 We’ve also got some great ideas on ways to make the festive season all the more memorable, from Winter Wonderlands in London, to German Christmas Markets in Birmingham. It’s time to make this Christmas one to remember! Join in the magic of Beauty and the Beast this December at Cardiff's New Theatre. Featuring an all-star cast of Lisa Riley, Gareth Thomas, Ben Richards and more. 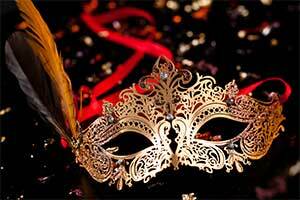 Expect laughter, extravagant costumes, special effects and an all-around amazing, interactive show! Re-discover the amazing tale of Hansel and Gretel in Derby. Featuring original music, colourful costumes and an incredible crew of actors and musicians, it's time to enter the gingerbread house again. Relaxed performances are also available for families and carers who would benefit from being in a more supportive environment. Enjoy the magical Panto extravaganza of Goldilocks and the Three Bears. This new take on the fairytale features a family circus going out of business and 3 bears who could help save everything. Starring Danny Adams, Clive Webb and Chris Hayward this isn't your average pantomime, with brilliant magic tricks and heaps of thrilling circus acts you'll be on the edge of your seat throughout! View the High-Flying Pantomime Adventure, Peter Pan, this Christmas. Starring Joe Pasquale and John Challis, this hilarious and fun show is coming to Nottingham's very own Neverland, the Theatre Royal. Make sure to look out for the incredible underwater 3D action, just keeping you fin-formed. 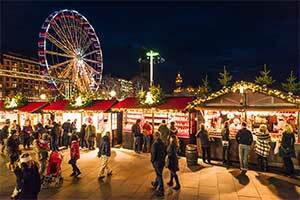 Eat, drink and be merry at the UK's largest outdoor Christmas Market. Stretching along Victoria Square and New Street, the market has over 120 authentic german food, drink and craft stalls. We recommend trying the delicious Bratwurst. It's not all food and drink though as the popular big wheel and ice rink will be making a return also! See Leicester square like never before as it's transformed into a jolly Christmas village, featuring 25 Christmas market stalls and a magnificent Belgian Spiegeltent! Take in one of the many shows that are performed in the tent; The Showstoppers Christmas Kids Show is a big favourite! Located in the Shopping Quarter, Bristol's Christmas Market is growing every year with over 55 wooden chalet stalls planned for 2018. Expect the mouth-watering aroma of delicious food and the odd festive drink in addition to a wide range of homemade crafts on sale. One unique element to this market is it's famous Yorkshire Pudding Wraps, not your typical yuletide treat but delightful nonetheless! Edinburgh's George Street Festive Market is a real favourite. Its spectacular new ice adventure is sure to bring in crowds from around the country! Taking you on a journey around frozen Scotland, this popular attraction features a giant advent calendar projection, breathtaking ice sculptures and fun-filled rides. See Bath in a new light this winter, Christmas lights that is, when its bumper market returns. As one of the UK's biggest markets, it's over 200 stalls long and stretches the streets surrounding the beautiful Roman Baths and the Abbey. Take in the exquisite sights, sounds and smells of Christmas whilst sampling what Bath's local stallholders have to offer. Did you know 80% of the market's stalls are from Bath and the local area? It's the place to be to get all your Christmas shopping done under one roof, with over 120 leading brands. This special weekend of live entertainment, music, treats and even Europe's biggest Christmas Kissing Tree, make for a shopping adventure you won't soon forget. Although the first switch on timings differ for each street, it's true that there's nowhere quite like the capital at Christmas. 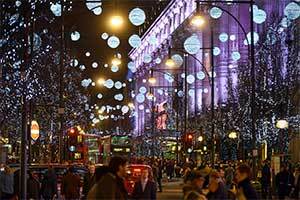 From one of London's biggest Christmas trees at the Covent Garden Piazza, to Oxford Street's classic light displays, it's impossible not to feel the spirit in the air. Prepare for some serious virtual adventure as The Polar Expedition Grotto arrives at the Trafford Centre. Join the reindeer herd, explore with the elves and even track down the big man himself, Santa Claus. If you love all things festive then this is the event for you, as Hyde Park's free Christmas utopia returns for another year and this time it's bigger than ever. The Magical Ice Kingdom is back and with a brand new theme, "Enchanted Forest", where you'll be able to discover a whole host of mythical creatures sculpted out of 500 tonnes of snow and ice. If you are more of a thrill seeker then Winter Wonderland's many rides and rollercoasters are perfect for you. Our personal favourite attraction is Bar Hutte's private karaoke huts. Enjoy festive food and drink with friends whilst belting out your favourite Christmas songs, it is the most wonderful time of the year after all! Put on your cosiest winter coat and grab your skates as Liverpool's Christmas Ice Festival is back for another year! Immerse yourself in the frozen wonderland by flying down the super-sized ice slide or skating around the huge ice rink. There's even a pop-up ice bar if you fancy a cold one. Enter the mystical world of NewcastleGateshead's beautiful Enchanted Parks experience. The ever-popular, after-dark trail is held amongst the atmospherical Saltwell Park and is home to some incredible, mystical art pieces, from light shows to sculptures. If you are looking for festive thrills out of the cold this Christmas then the Irn-Bru Carnival is the perfect place. As Europe's largest indoor funfair the carnival is filled with an abundance of amazing rides, stalls and attractions so there's something for all the family. Travelling on Christmas or New Year's Day? Don't worry, so are we. You can find a full list of services available on 25 December & 1 January below. Due to high volumes of passengers travelling across the festive period, luggage capacity is strictly limited to your ticketed allowance and additional allowance is subject to availability. To prevent delays, please view our luggage policy. Getting the coach is the simplest way to travel, whether you're off to see the family, or bringing them along for the ride! You can expect a guaranteed seat to stretch out in, a digital entertainment service, VUER, with free Wi-Fi, USB charging points and a driver who'll happily help store any luggage (or presents!) onboard. All you need to do is sit back and relax. Find out why more people are switching to coach and order your tickets today for travel throughout the festive season, including Christmas Day, Boxing Day and New Year's Day. Book with National Express coaches between 26 November and 23 December 2018, for travel until 31 December 2018, and receive 50% off a booking for travel between 7 January and 15 February 2019. If booking a return journey, the return must also be made by 31 December to qualify for the 50% discount. Original bookings must be made via nationalexpress.com. To receive the discount, customers must provide the email address they booked their journey with, and National Express will send the voucher code to the customer. The email address will not be used for marketing purposes - but if a customer has previously said 'yes' to receiving marketing emails from National Express, marketing preferences will not be changed by submitting their email address as part of the offer. Voucher codes can be used at nationalexpress.com/vouchers. Discounted ticket must be booked 3 days in advance of travel. Discounted ticket must be booked by 12 February 2019. Maximum of 2 people can travel with the voucher, one booking per voucher. Discount applies to one-way and return journeys. A £1 booking fee applies. Discount excludes European, Festival & Events, and special services. Offer not valid where accommodation or admission are included as part of the overall fare. If you amend your discounted ticket, the 50% discount will not be reapplied. Offer may be withdrawn, suspended or altered at any time.